Just wanted to post a video with my highlights from a rainbow trout fishing trip to Rock Bridge, Mo. This is probably the 5th trip I've made there and this was by far the best action. I decided to bring my GoPro along with me this time and capture the action. I realize there are many improvements to be made when capturing footage for the video, which will hopefully be improved upon in subsequent attempts! All fish were between 2-4 lbs, with the one attached being the biggest. I used Joe's Flies short striker flies for the first time and they were incredible. I removed the trail treble hook and just used the single hook. Unfortunately, the hook straightened out about halfway through the day, but was able to be bent back to shape with no issues. Let me know if you have any questions and I'm happy to give more info! 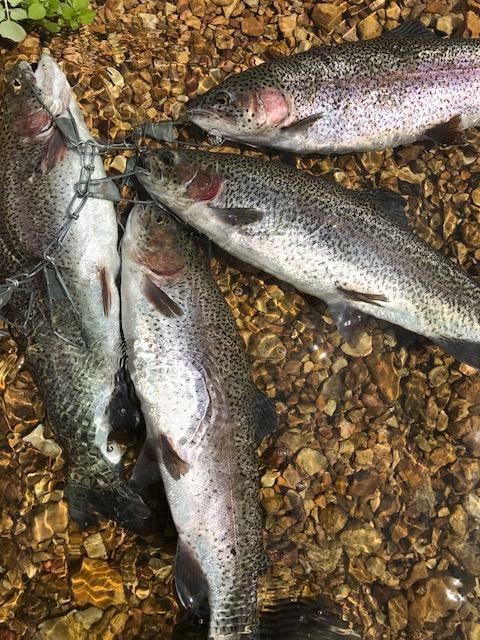 Some nice trout - excuse my ignorance - but what is Rock Bridge? Is it a trout park? Thanks! Rockbridge is an unincorporated community in Ozark Co., Mo. Years ago, it was the site of an old mill that sits on Spring Creek. Nowadays the community is owned as a Trout & Game Ranch, which includes hunting and fishing. It's a beautiful little community with really good fishing and a pretty decent restaurant on-site that is nice to get a bite to eat after fishing all day. Nice ! Rockbridge is a fun place. Shoot some clay birds, catch a few trout, hit the gravel bar in the old mill for a cocktail, then eat a good dinner near the Arky border, go to sleep in a clean bed. Have not been in awhile. Been Married 12 yrs and my wife learned to fly fish there and at Westover while we were dating. Our girls are 9 and 11, think will take them and pair with a float on the NFoW. That water looked awesome. Looked like a great spot to fish. Are they stocked daily like the trout parks? They definitely were not shy in that clear water. Congrats! Yes, Rockbridge has it's own hatchery on-site. 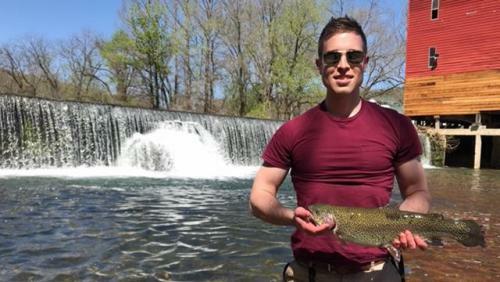 I certainly prefer catching "wild" trout, but this place is great when you want to have your rod bent with some big fish and also fill up your freezer! Honestly, that day was the most worked up I had seen them... I usually always have good success there, but they were crazy that day. I was using one of the Joe's Flies Short Strikers all day long and it was catching more fish than I had ever experienced. I've had very good luck using those in other places as well. Do you still have to keep every fish caught, and how much per pound is it these days? I enjoy the restaurant there when in the area, but haven't fished there for the above reasons. Looks like on their website you can do C&R fishing for $105 per day. You can also get guided trips which would be good for you. Its cheaper to keep them. One thing about Rockbridge fish. They are big in the C&R section. They don't fight like hatchery fish either. The Mrs. and i have done a half day C&R together and then when we had Reeling and Healing and Reel Recovery I did a half day Solo. Fun for sure.